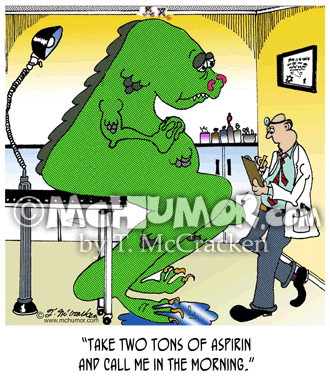 Drug Cartoon 4925: A doctor saying to Godzilla, "Take two tons of aspirin and call me in the morning." 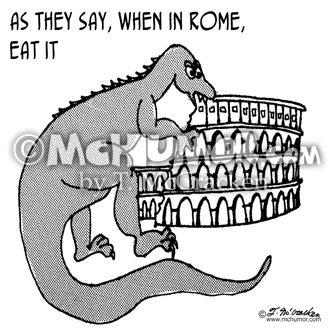 Diet Cartoon 3284: Godzilla eating the Coliseum. 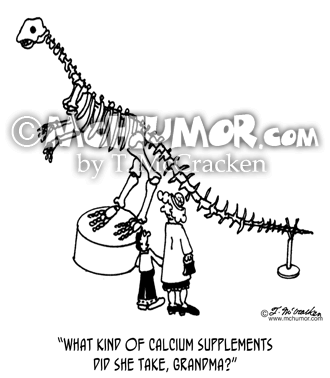 "As Godzilla says, When in Rome, eat it." 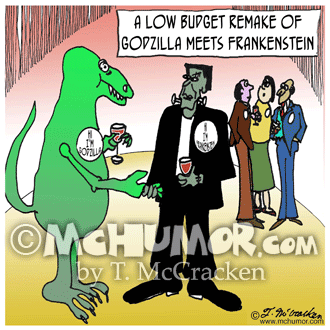 Movie Cartoon 3993: "A Low Budget Remake of Godzilla Meets Frankenstein." At a convention where both are wearing name tags one says, "Hi, I'm Godzilla" and the other says, "Hi, I'm Frankenstein." 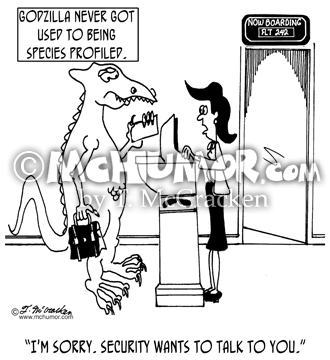 Passenger Cartoon 5144: An airline clerk saying to Godzilla as he tries to board a plane, "I'm sorry. Security wants to talk to you." "Godzilla never got used to being species profiled." 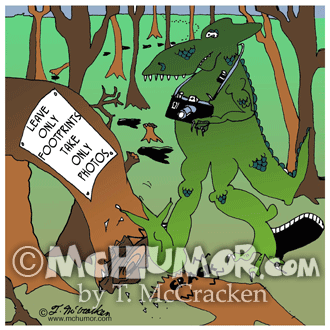 Photography Cartoon 5025: Godzilla with a camera around his neck crushing a in a park tree with a sign: "Leave Only Footprints, Take Only Photos." 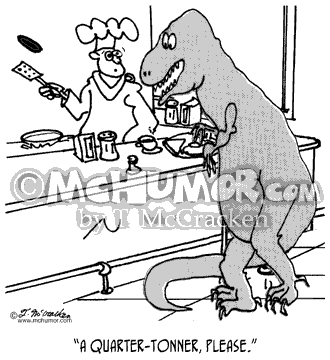 Convenience Food Cartoon 3406: Godzilla in a fast food diner saying, "A Quarter-Tonner, please." 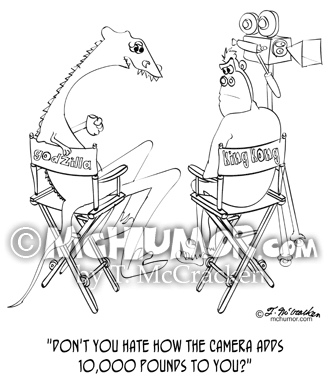 Weight Cartoon 9314: On a movie set a thin Godzilla says to a very thin King Kong, "Don't you hate how the camera adds 10,000 pounds to you?" 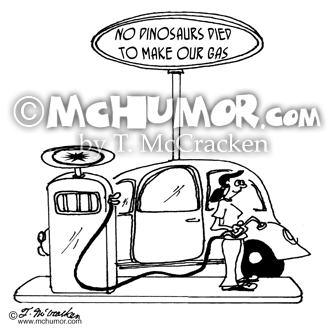 Geology Cartoon 6837: A sign at a gas station, "No dinosaurs died to make our gas." Education Cartoon 4745: "Students excuses through the ages." 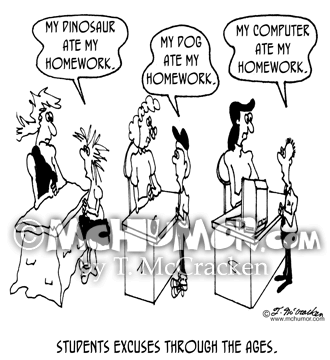 A cave kid says, "My dinosaur ate my homework," a 1950s kid says, "My dog ate my homework," and a kid today says, "My computer ate my homework."